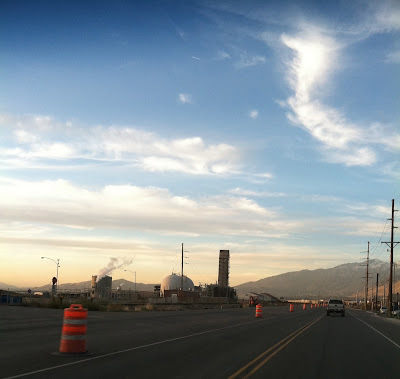 Each morning drive to the gym brings Emmett and I past this lovely chemical plant. (Gyms always seem to located in the industrial section of town.) This storage tower immediately elicits from Emmett the following: "Mom it is Emmett, Idaho!" Which inevitably draws a chuckle from me. On our road trip to Oregon, we passed through a town called Emmett, Idaho. It was monumental for Emmett. Apparently the distinguishing features in his mind were the abundant grain towers. Chemical tower. Grain tower. It's all the same, right? Hmmm.